Your Band Is a Virus Review The ultimate marketing guide for serious, independent musicians and bands. Getting recognition for yourself or your band is not just how unique your music is, or how good your vocals sound. If it was a simple matter as that every independent solo artist and bands alike would be dripping in success and have ten’s of thousands of fans chasing them around the world from gig to gig. So let’s get serious and take a moment to reflect on just what it takes to get you or your band noticed and your music sold to an ever expanding fan base you created by your own DIY promotional means. Not long back in 2012, a guy called James Moore introduced himself to me, since then, I have corresponded with him on several occasions. James is an independent music Promoter; his key business is promoting independent solo artists and bands to give them the press they deserve. 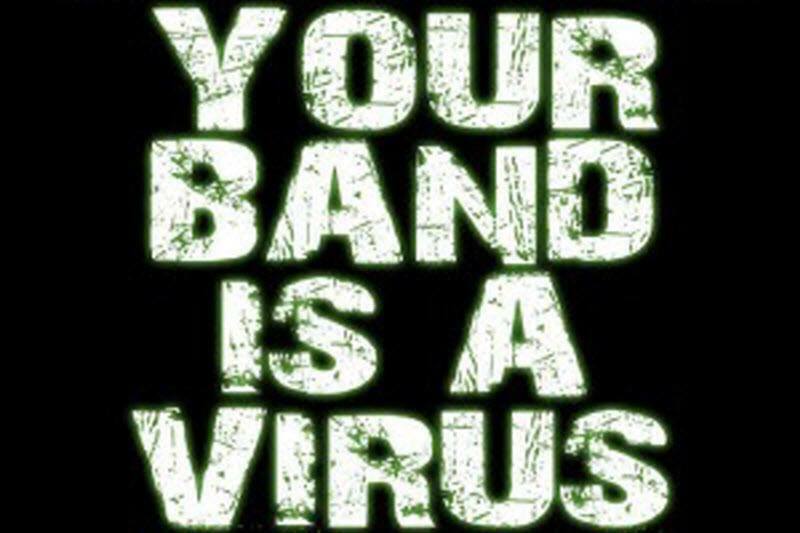 James runs a website called independent music promotions and is also the author of YOUR BAND IS A VIRUS! James wrote this book for those who want to do their own D.I.Y promotional stuff and save themselves money by not having to employ professional services like James provides. Having read Your Band Is A Virus myself, I can highly recommend it to any serious independent musicians and bands to get hold of a copy. I’m so impressed with the content that I have asked James for an author’s interview and James as agreed to do it. You can read the results of that interview exclusively on Jabberdi. My interview with James Moore. James sent me a copy of his new book to review. Before I even opened the book to read the first chapter, I asked myself one question. If I was a solo artist or a band member, would “Your Band Is A Virus” help me to get myself or my band out there in front of the right people? I can categorically state that after reading it from front to back, there are a lot of extremely positive things you can do to achieve recognition from the people who matter the most. The music industry is full of hopefuls waiting for the right break to come along. Many believe that just concentrating on their music and uploading to website’s like YouTube will lift them to the heights of success. Okay, you can wake up now; the dream was great but the reality stinks. Just like the old days, you will only get noticed by those who can pull the right strings for you. If you can put yourself in front of the right people and show you are committed to your music career things will start to happen. I’m sure you would agree that having a fan base will also help in convincing others that you have arrived, and it’s your time to grab the limelight. However, without working just as hard on promoting yourself as you do on creating your music and image, there will be no one around to listen to your latest masterpiece. YouTube is a favorite of many who hope to find success, no one would dispute its a massive website with thousands upon thousands of people visiting every day looking for new and old solo artists and bands they want to view and listen to. That in its self should tell you something about putting you or your band in front of possible future fans. However, just uploading and expecting people will find you is not going to happen. Not a chance, unless they know you are there and who they are searching for. That’s one of the main reasons why people do cover songs, riding the wave on someone else’s song title hoping to get some views and credit for an excellent cover of a song. You will need to do a lot of hard work to become seriously popular as a cover artist to get the highest recognition covering other artist’s songs. You only have to look at bands like the Cimorelli Sisters. (who were also independent at one time) And you would appreciate how hard they worked at promoting themselves. Do a search on any of the major search engines to find pages of press they have created for themselves? They don’t just have the talent to create music. They are also very talented in promoting who they are, right down to how to buy their music. Yes believe it or not they dedicated a video on how to buy their music from off Itunes. Think that’s a little extreme? Maybe, maybe not, but the point is if you don’t cover all your bases you will not achieve what you want. Once you start to build a fan base you need to feed them, you are their food. They want to help you reach the top even if that means ringing around their local radio stations and asking begging them to play your latest song, they will do it for you because a dedicated fan wants to be part of your family. However, before all or any of that happens you need ways of effectively promoting yourself or your band to the masses of eager people who want to be a part of your family. This is where James Moore and his book your band is a virus come into its own. With pages of real-life experience in promoting many bands to recognition, you will be in good hands. Your band is a virus explains in simple to understand terms all the different types of marketing you can subject yourself or your band too. And you will be happy to know everything in Jame’s book can be done for absolutely free! Once upon a time before the internet, it was legwork and door knocking trying to get some record label or producer with a wad of money or a manager with the right connections to back you. Your Band Is a Virus covers everything you need to know to accomplish your goals of becoming recognized as someone or a band to be taken seriously. As the owner of Jabberdi I get lots of solo artists and bands asking to be featured on my site, sadly 99% of those asking cannot even answer a few simple questions or show the ambition required to reach the first step of the ladder. It is so important to show people that you are serious about your music and what you do and why they should drop everything and listen, or even watch you perform live. If you are not passionate about your music and your live performances, how do you expect anyone else to be? James brings it home to you in a simple readable easy to follow format. Reading the book will allow you to take you or your band from 0 – 100 in the promotional stakes. and many other highly successful people in their music careers. Publishing these interviews alone are all inspiring and the knowledge you will take away from reading your band is a virus is priceless and should be your first port of call to absorb all the knowledge you will need to get yourself noticed. 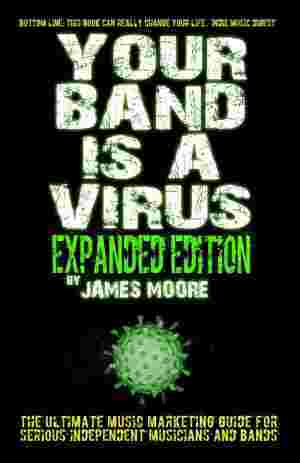 James Moor has done an excellent job of authoring Your Band Is A Virus – Expanded Edition. The unique aspect of the book: Is the underlying goal to provide musicians and bands alike with the best music marketing guide available today. Its pages are filled with actionable advice from the perspective of a DIY promoter. Everything written in the book is written from the perspective of someone who does this daily to promote solo artists and bands to gain higher recognition in the entertainment industry. Do not put aside your band is a virus as the usual entertainment lawyer or label CEO type book. The book discards the conditioning of the music industry titans, suggesting artists don’t always follow the rules and wait in review queues but instead should think creatively and use ways to gain people’s interest in their music. Overall, the book is a cracking read and should be used by serious independent musicians and bands to gain a foothold and open doors to success and most importantly earning money from your music. Your Band Is A Virus has everything in it; you need to know about, how to get your band or yourself noticed, all you need to do is read and take action on the contents. You can buy the book on Amazon.com Or Amazon.co.uk in paperback or digital formats right now.